Early last week the Buffalo Bills signed veteran backup quarterback Derek Anderson, who has spent most of his career with the Carolina Panthers, thus his relationship with Bills Head Coach Sean McDermott. Anderson was drafted by Baltimore but spent the early part of his career with the Cleveland Browns and then a year with the Arizona Cardinals. He was with Carolina for the last seven seasons. Why did the Bills sign Anderson? I feel that the Bills decision makers felt they needed a veteran presence in the quarterback room. Nathan Peterman is only in his second year while Josh Allen is of course, a rookie. A veteran that young guys can lean on is a valuable commodity, specially at the quarterback position. At the time of the signing, I felt that as soon as Anderson felt comfortable in the Bills offensive system he would become the starter. It’s not because he is any more physically talented than Allen but rather because he has the experience. We all can agree that Allen has been inconsistent at best as a starter and much of that has to do with his inexperience in the NFL and the level of competition he played with in college as well as his college offensive system. If we go back to right after the draft, the plan was for Allen to sit and learn for the 2018 season. When Peterman failed as a starter, the Bills had no choice but to start Allen. With Josh not really being ready, the experience he is going thorough can do more harm than good. Quarterbacks have to build confidence and too much negative play can only hurt that confidence. Anderson is not about to lead the Bills to a Playoff spot but with their strong defense he can help them win some games that they otherwise wouldn’t have a shot at. There is not a doubt in my mind that had Anderson been able to play last Sunday in Houston, the Bills would have won. Numbers don’t always tell the story with a player like Anderson. As a backup, he seldom got a chance to play extensively. Playing a few snaps in the fourth quarter is hardly a way to build up statistical numbers. What we have to do is look at what he has done when he has had extended play in the past few years. In 2014 while with Carolina, Anderson was 65 of 97 for 701 yards, five TD’s an no interceptions. In the two games that he played a lot, the Panthers won and he had a quarterback rating of over 100. The other time he got significant playing time was in 2016 where statistically he wasn’t as productive (36 of 53 for 453 yards, two TD’s but five interceptions). Carolina lost both of the games in which Anderson played a lot to division rivals Tampa Bay and Atlanta. Having not seen those games, I can’t say if Anderson was or was not at fault for the losses. That aside, Anderson has the experience of playing in the NFL for 13 seasons and getting game time in 12 of those 13 years. There are not that many backups in the League that have as much playing experience as Anderson. That alone will help the Bills because he has been there before. Playing as long as he has in the League, Anderson has been around several offensive systems and that will help him when learning the Bills current scheme. Offensive Coordinator Brian Daboll may have to simplify things early on, but the main thing Anderson has to learn is terminology. Plays from team to team are very similar, it’s the terminology that is different in how a play is called. This week the Bills play the Indianapolis Colts in a game that they should be able to win. The Colts are going through similar growing pains as the Bills, the difference being they have a great veteran quarterback. The Colts receivers are similar to the Bills in that they aren’t productive and struggle to get open. 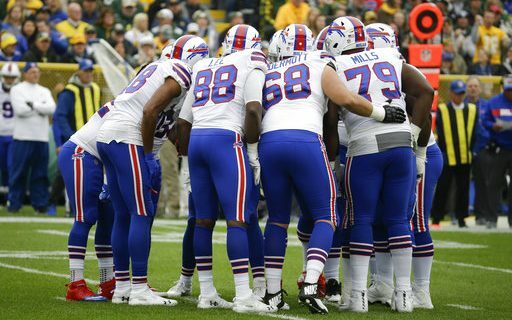 Comparing defenses, the Bills have the stronger unit. That said, what Anderson has to do is not make mistakes. Make the plays he is capable of making, score some points and let the defense do their job. With the experience he has, he won’t be nervous and he won’t let a mistake hurt his play. He’s been there and done that and more than anything, that will help this Buffalo Bills team.